Basically, I think there are two visions for free and Open educational resources and technology, that can be summarized by these two figures. In the left figure, we have the “closing gaps” vision. In this vision, everyone benefits from new educational technologies, but low-income students disproportionately benefit. The hope here is that as the ecology of education is flooded with new free and nearly free resources, low-income students will have access to resources previously only available to students in schools in affluent places. Take Khan Academy as an example. It’s possible that students in wealthy schools have access to great instructors and plenty of content resources, so Khan Academy is just one more tool in their kit which only offers a minor benefit to these students. But maybe students in schools serving low-income kids have more novice teachers and fewer content and instructional resources, so Khan Academy with it’s free material represents a major boon for these learners. This is a hypothetical scenario of how Khan Academy might disproportionately benefit low-income students. In the right figure, we have the “rising tide” vision. In this model, everyone still benefits, but now the wealthy disproportionately benefit. From a John Rawls framework, this is still a good thing–everyone is better off than before–but the opportunity gap between wealthy and poor has expanded. Consider Khan Academy again. Maybe teachers in wealthy schools–with fewer students per teacher, more students passing tests, more prep periods, fewer classes to teacher, more curriculum support, more IT support, etc.–are better able to use Khan Academy videos not just to push content to students, but to reimagine pedagogical models. These teachers use the content to flip the classroom, differentiate and personalize instruction, release students from seat time requirements, etc. Any of these new models are possible because teachers can assume that every kid has reliable broadband internet access at home and on their mobile device. By contrast, maybe teachers working in schools serving low income students simply can’t make as much use of the Khan Academy videos because they lack the planning time, broadband access, etc. In this model, schools with greater fiscal and human resources have more capacity to take advantage of even free and open resources. This second model is actually quite troubling in its implications. If this model is generally true, then virtually every education technology initiative which does not specifically target the needs of particular populations will disproportionately benefit the wealthy, even if the materials are free. We don’t necessarily have to sit around and guess which model is true, we can use research to answer these questions empirically. This is what I have tried to do with my research with wikis. My assessment of our findings is that in the case of wikis, the second scenario is certainly true. Wikis are more likely to be created in wealthier schools, more likely to persist longer, and more likely to create opportunities for students to develop 21st century skills. Even within schools, wikis are more likely to be used with AP and honors tracked students (who in turn are more likely to be affluent) than with lower tracked students. I don’t think low-income students are harmed by the innovation of wikis, and I think there are plenty of instances where low-income students have had great opportunities with wikis to work collaboratively and create multimedia publications of their understanding. Of course, research about wikis doesn’t answer every question about these two models of ed tech and inequality. Are blogs any different than wikis? Possibly, though I can’t imagine why. Are Khan Academy videos different? Possibly, although again, it’s not clear why they would be. But these are empirical questions that we can answer with research. 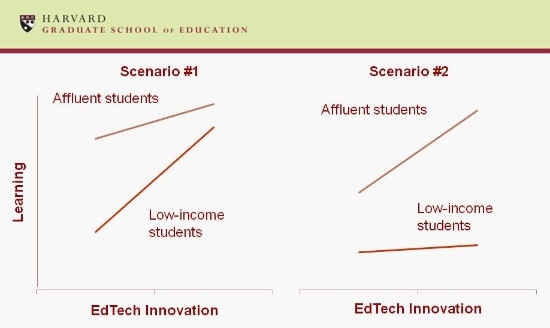 So if education technology does disproportionately benefit the affluent, what should we do about it? Let me offer three suggestions for teachers, developers and funders. For teachers, the orientation towards inequality with technology is very important. Educators need to make a commitment to using social technologies with all their students, not just honors and AP students. Many teachers working with at-risk youth are concerned about inequities with technology access within their classrooms, but urban school teachers need to be more concerned with inequities between schools. We need to ensure that urban and rural students have the same opportunities as their suburban peers. We can’t make it so no students in a class have a tech-rich learning experience because some students have difficulty with access. That’s fair within a classroom, but not within a society. Technologists, designers and researchers need to develop technology initiatives that specifically target the neediest students. TechGoesHome is a fabulous program that provides netbooks and internet connections to students, along with computer training for the entire family. The Glitch Game Testers in Atlanta, have built a program that hires African-American male students as game testers, teaches them the AP Computer Science curriculum, and has an incredible placement rate in not only getting these kids into college, but into engineering and CS majors. Bootstrap is a terrific program that teachers students to program their own video games, developing algebra and computer science skills at the same time. . The Leadership Public Schools use CK-12 Flexbooks to develop content for math and science courses that build literacy skills while teaching domain knowledge. These programs are much more likely to benefit the students who most need our support and investment. Focus funding streams on students who most need support. Finally, the big foundations supporting ed tech innovations: NSF, Gates, Hewlett, and MacArthur need to be sure to focus a considerable part of their funding streams on students who most need support. A terrific example of this are the Gates/Hewlett Next Generation Learning grants, which target specific kids in specific high-risk courses. I’m sure down the line that all students will benefit from these kinds of experiments, but if we start by focusing on the kids with the most needs, then we’re more likely to create a scenario where education technology is vehicle for meliorating rather than exacerbating educational opportunity gaps. So those are some of my thoughts on the topic… obviously there is much more to say. If you are interested, I will be giving a Berkman Luncheon talk on the topic this January. If you have questions or reactions, please leave me a comment! Subscribe now and get involved with the Educational Technology Debate. « Do Open Educational Resources Actually Increase the Digital Divide? Written by Justin Reich on December 8, 2011 in OER and Digital Divide. An interesting argument to open up here. But wondering how you expect (and why you expect) Scenario #2 to happen as you draw it when your example is ready-to-use OER as opposed to wikis (which require considerable on-going resource from educators if they are to be hosted locally). I accept that well-resourced learners are well resourced so could make more use of OER should they choose to do so, and the same for their teachers. However these students already have many competing demands for their attention in terms of learning options. And not just their learning attention. Being online all the time competes with as well as enhances opportunities to access educational content. Here is Chris' post in full:An interesting argument to open up here. But wondering how you expect (and why you expect) Scenario #2 to happen as you draw it when your example is ready-to-use OER as opposed to wikis (which require considerable on-going resource from educators if they are to be hosted locally). I accept that well-resourced learners are well resourced so could make more use of OER should they choose to do so, and the same for their teachers. However these students already have many competing demands for their attention in terms of learning options. The well-resourced teachers in scenario #2 would have to be willing to change their teaching (which is already at a high level in your example) to reuse someone else's resources. There is no evidence that reuse will happen at a high, transformational, level in this case. Resource reuse is most likely to happen where there is a gap in the provision, or the offered resource is significantly better than what it replaces. Forgetting OER for a moment, we know this about reusable learning objects, and the behaviour of well-resourced educators with relation to these. They repurposed the resources, or made their own versions, or (most often) preferred their own versions but took new ideas or assets from the RLOs. This was part of what they did in refreshing their teaching, so it was not a huge change, just a boost.You are also ignoring the opportunity that parents and carers can now direct poorer students to OER. One of the reasons that affluent children do better in school is because of the support of learning at home. For poorer students, where parents may not be well-educated, the great thing about OER is that these are OPEN. Not just the schools can get access. Not only registered students. I wonder at this point how open the wikis you refer to were?This is an important discussion, it addresses over-hype and perhaps unrealistic expectation of OER (although you are sticking with the developed world here and there is another story to tell globally). However I think that your graphs overstate the case and I am struggling with the comparison of what happens with intra-institutional wikis (if that was what you were looking at) being an indicator for what will happen with OER. I'd suggest a scenario #3 with both rising to some extent but not too much for those who already have good learning resources. After all, access to online all the time via a flashy iPad. smartphone, etc. will not only be used to access education. There is quite a competition for attention going on there from Facebook, YouTube (not the formal educational stuff), etc.Thanks for raising this. Your post rings the right note for bridging the gap between privileged and under privileged kids. It is important that such resources like Khan academy be used for the kids belonging to the lower strata. The society need to focus on such children, then only an equality in education can prevail.. I hope you don't want to say that OER are worthless. The first what is necessary to do is the comparison with the situation there are no free resources and everybody must pay for everything. Let's try to add such scenario and graph! In reading Justin Reich's research, I am struck not by the radical notion that OER is widening the gap between privileged schools and everyone else, but how obvious this observation is once you look for it. As a recent New York Times article says:No one seriously disputes the fact that students from disadvantaged households perform less well in school, on average, than their peers from more advantaged backgrounds. But rather than confront this fact of life head-on, our policy makers mistakenly continue to reason that, since they cannot change the backgrounds of students, they should focus on things they can control. I feel that many proponents of Open Educational Resources fall into this same trap – they disregard the reality that any resource equally distributed will be more beneficial to those already blessed with advantages and often fail to make outsized investments in supporting poor schools and their teachers. Not to say they are alone in this error. Its sadly too common across all ICT4Edu activities. With respect to OER a lot depends on what you mean by OER. I am a strong proponent of OER as a way to increase opportunities for participation, not as a way to put cheap (or free) content into the hands of more people. In that way OER can have a positive effect on individual learners that would otherwise be held back by lack of access to quality education opportunities (and are more likely to be attending poor schools). The post opens an interesting debate, but I do not understand how the research conducted supports the hypothesis that technology innovation will disproportionately improve the "learning" of students in wealth schools. The indicators mentioned are "likelihood that a wiki was created", "persistance of the wiki" and "opportunities for development of 21st century skills within the wiki". The first two have no explanatory value for the quality of learning that individual students achieve. The latter may provide more useful insights and I hope the author will share those in follow up posts or comments. Please note that my comments are not directed at the value of doing more research in this area. I am also not trying to argue against the hypothesis that technology disproportionately benefits some students (although my own anecdotal experience suggests the differentiator is not household income or quality of school). I am simply wondering how generalizable these findings are. Here's more empirical evidence, from research done by the Inter-American Development Bank, that learning technologies can widen the performance gap: "Information Technology and Student Achievement: Evidence from a Randomized Experiment in Ecuador," http://idbdocs.iadb.org/wsdocs/getdocument.aspx?d…. I very much appreciate how Justin's post frames the issue of (in)equality of access to technologies in terms of economics, as opposed to geography. As Wayan points out, this is the reality not just for technological resources, but for educational resources–and indeed education–in general. As a result, I think that Justin offers a very practical way to look at the challenges of access facing ICT4Edu (and ICT4D) initiatives, which in turn allows us create actionable solutions to address them. Also, although we are talking about OER in this discussion, I think that part of what Justin is seeking to remind us is that the notion of "access" isn't limited to content alone–and that the availability of content does not in and of itself equal "access". For example, for less wealthy students (and teachers) a lack of access can mean not having the hardware necessary to view and/or engage with the content at similar levels as wealthier students. As Justin mentions, differences in access to technology at home has a significant potential to impact that technology's ability to support attempts at bridging educational inequalities. A New York Times article from earlier this year states that only 60% of households in the rural US have broadband Internet access (http://goo.gl/Mbi9P). In another recent article from The Mark, research quoted shows that over 10 million students in the US National School Lunch Program live in one of the approximately 5.5 million American homes that do not have broadband Internet. Statistics Canada also reports that in 2010, 21% of Canadian households didn’t have Internet access at home and that this gap in Internet access is strongly correlated with gaps in income (http://goo.gl/trWLp). And these are examples of disparities just within industrialized countries. With this context in mind, I think that Justin's three suggestions for greater equality are useful and important starting points for thinking about how OER and ICT4Edu initiatives can consciously go about striving to decrease–rather than unwittingly increase–digital divides. Thanks for your provocative thoughts and candid feedback; I especially welcome the criticisms above. First, I'll respond to Philip who writes: "I do not understand how the research conducted supports the hypothesis that technology innovation will disproportionately improve the "learning" of students in wealth schools." It's not clear, Philip, if you read the empirical study that I linked to in the OP. It's an article, forthcoming in Educational Researcher, called The State of Wiki Usage in U.S. K-12 Schools: Leveraging Web 2.0 Data Warehouses to Examine Quality and Equity in Online Learning Environments. A pre-print is at http://www.edtechresearcher.com/?page_id=50. That provides quite a bit of the empirical support for my argument. I would certainly not say that I have proved in that article that wikis improve student learning for rich kids or anyone. But I do provide some pretty compelling evidence that wikis are very differently in different kinds of settings– wikis are more likely to be created in wealthy schools, more likely to persist longer, and more likely to provide opportunities to develop 21st century skills. If all wiki learning is completely pointless, then these differences don't matter. But if you think that wikis might be a way to develop student learning, then these differences are quite troubling. They certain "support the hypothesis" much more than they might be used to refute it. @Borivoj I definitely don't think that OER are worthless! In fact, both of my scenarios make the assumption that OER is good for everyone. Someone like Larry Cuban might strongly oppose this position, and argue that there is preciously little evidence that education technology as applied in school settings makes any difference in student learning whatsoever (which might support Philip's argument as well). But, I do think that there is a notion that OER, because it is often free, will disproportionately benefit the neediest in society, and I think that notion should be interogated very seriously, ideally with studies that provide some empirical evidence about who is doing what with what kinds of tools. @Chris My empirical study does not address the issue question of how caregivers distribute resources, but I do think my argument is probably correct in this domain as well. As Shilpy notes, who is sharing Khan Academy with their kids? What kinds of parents have the social capital to know about that, provide home broadband access etc? If you talk with the developers of the Scratch programming tool, their hunch is that most users are the children of scientists, programmers, and engineers, rather than a more diverse group of families. But it's very fair to say I have no evidence on that point, and people should study this more. I think we'll continue to see an effect which has been documented going all the way back to Sesame Street– dump free content online with designing it for specific populations and the affluent will benefit more than low-income students. I could make a similar riff about developing countries. Again, I have no empirical evidence, although jamesbt supplies some, although I have spent some time in schools in Tanzania, northern India and Rajasthan. Again, I think interventions that are not designed to support schools with no electricity, poorly trained teachers, short school days, high levels of illiteracy, etc are unlikely to provide equal benefit to the rich and poor. Thanks all for your thoughts, and feel free to continue to harangue me! Failed to get a notification of your reply. My reply to the reply. My comment was directed at the link between *learning* and "wiki use" or "wiki persistence". I don't think the simple existence of a wiki can be associated with 21st century skills. The strongest link between 21st century skills and wiki use can be observed in collaborative wikis. Among your sample of 255 schools are very few cases of actual collaborative wiki use and higher percentage of collaborative use in poor schools (title 1): two percent of wikis created in title 1 schools and one percent of wikis created in non-title 1 schools. Where does development of 21st century skills really kick in? This category of wikis with scores between 3-15 is significantly more common in well resourced schools. However, as you mention in your paper these wikis "have no collaborative behaviors and limited evidence of expert thinking or the use of multimedia features." You work demonstrates that wikis are more likely to be created and last longer in well resourced schools. I think you also show that most teachers and students do not know how to use wikis to foster the development of 21st century skills. I share your concern about equity issues think there is valid criticism of the OER movement in this area. But I fail to see evidence that supports the claim of this post's title (even if you did not choose the title) and I would like to see more evidence of 21st century skill development linked to concrete policy recommendations. I look forward to continuing this next week at the Hewlett meeting and hope my initial comments were not taken as anything but an attempt to get to the heart of these important questions together. Well, I understand. Maybe you can consider to change the title of your article to Low income students need bigger support than others. In today's world many people read only the beginning and it suggests that OER aids someway to increase inequalities. The factual reason is somewhere else. This remind me the usual discussion with our teachers. They still often wish to dismiss technology usage because they believe it has a bad influence to students. The only possibility how to solve this is the general elimination of technology everywhere. @Borivoj…haha, I didn't even notice the title. Wayan chose that… the original title was "Will Free Benefit the Rich?" In general, in any kind of media source–except maybe academic journal articles–it's often the case that writers don't choose their titles. I think you raise an important point about how we frame these issues. But we can't back away from the data if they challenge our positions or beliefs. Has a new technology *ever in history* been dispersed/adopted evenly throughout a population? Well.. before Gutemberg only rich people could access books or “papers". Not that the population adopted the printing press, they didn´t have one at home, but it definitely made things different.